HLC assays provide numerical results, are less labour-intensive and interpretation is less subjective compared with electrophoretic techniques. For many patients, accurate quantitation of monoclonal proteins by SPE is not possible for a variety of reasons (such as co-migration or dye saturation issues, Section 17.4). 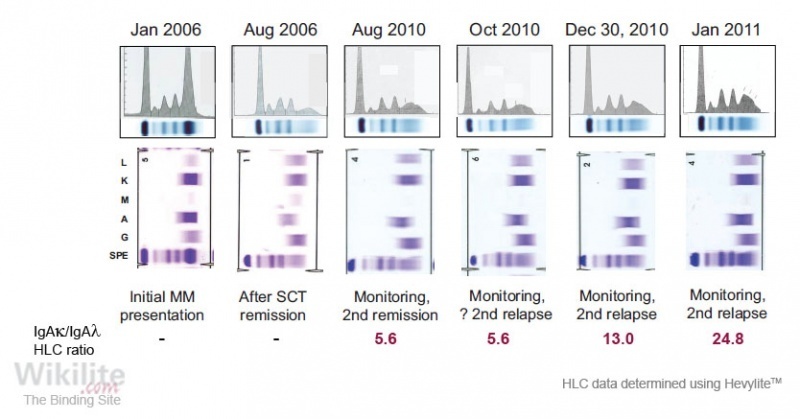 In such cases, HLC assays can provide clarity for monitoring patients. This is acknowledged in the 2016 IMWG consensus criteria for response and minimal residual disease assessment in multiple myeloma  which states that Hevylite can overcome the limitations associated with monitoring β-migrating monoclonal IgA by electrophoresis. One such patient is described in the clinical case history below. For patients with a measurable monoclonal protein by SPE (M-spike), the relative change in the involved HLC or dHLC (involved - uninvolved) concentration has been shown to be equivalent to the relative change in the M-spike (Section 11.5.2) . Michallet et al. compared responses assigned using Hevylite assays with those assigned using standard IMWG criteria for 463 newly diagnosed IgG and IgA IIMM patients enrolled in the IFM-2009 trial. Hevylite responses were based on changes in dHLC concentrations, and a complete response required normalisation of the HLC ratio (in addition to <5% bone marrow plasma cells). Post-consolidation therapy, there was a good agreement in assigned responses for ≤PR (79%) and ≥CR (92%) categories. By contrast, for patients with a very good PR (VGPR) by IMWG criteria, assigned HLC responses were concordant in only 45% (102/225) cases, with the remainder assigned as PR (18/225) or ≥CR (105/225) by HLC. The clinical outcome was significantly different between these HLC response categories (PR: PFS = 21.3 months; VGPR: PFS = 28.9 months; CR: median PFS not reached. p<0.0001), and the authors conclude that HLC responses correlate better with clinical outcome than current IMWG criteria. Confirmation of disease progression in a patient with a broadly migrating IgA monoclonal protein. A 71-year-old female with a 9-year history of MGUS presented with anaemia and hypercalcaemia in January 2006 . SPE showed a 48 g/L broadly migrating monoclonal protein in the γ-region. The monoclonal protein was identified as an IgAκ intact immunoglobulin by sIFE (Figure 18.11). Total IgA levels were 47.2 g/L and there was an abnormal sFLC κ/λ ratio (7.0). A bone marrow biopsy indicated 40% monoclonal κ-restricted plasma cells. A bone survey revealed diffuse osteopenia, multiple small lytic lesions and a lesion consistent with plasmacytoma in one of the thoracic vertebrae. The patient was diagnosed with MM (Durie Salmon stage IIIA). The patient was successfully treated and achieved a serum and urine IFE CR, which was sustained for 18 months. Subsequently, the patient relapsed with monoclonal IgAκ (39.2 g/L), as detected by electrophoresis. She was successfully treated with Revlimid and dexamethasone, achieving a second CR (Figure 18.11, August 2010). Between August and October 2010, although electrophoresis remained negative, total IgA levels increased steadily and became abnormal. Concurrently, the patient developed a lung infection (Figure 18.11, October 2010). The elevation of serum IgA may have been attributable to the infection or, given the patient’s history, due to disease relapse. However, IFE did not identify a monoclonal protein until January 2011. 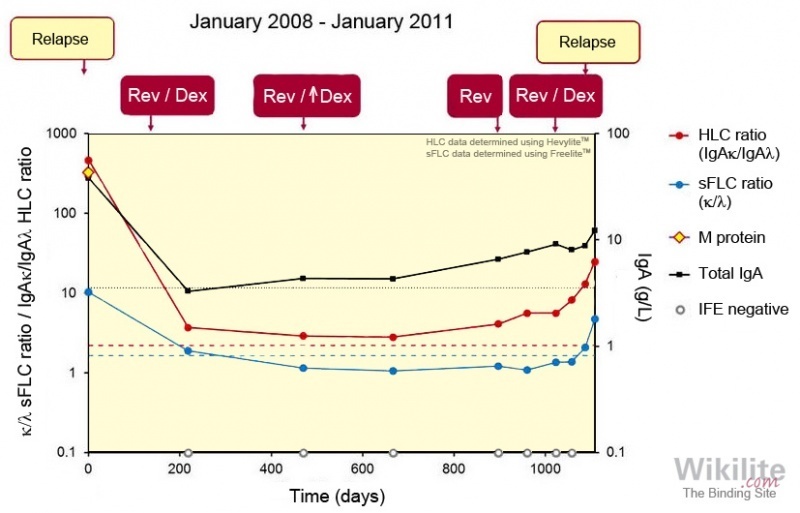 Retrospective HLC analysis was performed on the equivocal samples taken between January 2008 and January 2011 (Figure 18.12) The IgAκ/IgAλ HLC ratio decreased in response to treatment after the first relapse (January 2008) but did not normalise, possibly indicating residual disease. In the following months, HLC ratios increased steadily, supporting the existence of an abnormal clone despite the apparently normal IFE results. The authors concluded that IgA HLC assays were particularly beneficial for monitoring this broadly migrating monoclonal protein, which was difficult to identify and quantify by serum electrophoretic techniques. In addition, IgA HLC was more sensitive than electrophoresis measurements for detecting disease relapse.